Statistically analyse the information that the users of our site access. The data collected may include the browsing activity of the user when it visits us, the path followed by users in our site, information on the visitor’s Internet service provider, the number of times that users access the site and the behaviour of users in our site (pages visited, forms filled in and similar). Identify users who visit us from an invitation from an associated website or a sponsored link. If you want to receive additional information on the activity of advertising companies in Internet and on how to delete their data in the records of these companies, we recommend visiting www.networkadvertising.org. 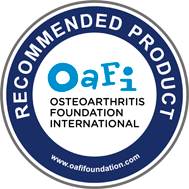 OAFI (Osteoarthritis Foundation International) is the International Osteoarthritis Foundation. It worldwide leads projects of prevention, awareness, treatment and improvement of people with osteoarthritis’ life quality or the ones susceptible of suffering it. This page uses their own and third-party cookies to improve our Services and show you the information related to your preferences, by analyzing your browsing habits. If you continue browsing, we will consider you to accept their use. You can obtain more information by visiting our cookies’ policy.